Olivia has been very passionate about helping the giant panda for some time. She decided last summer, when she was 9 years old, that she wanted to run a lemonade stand and donate all the money earned to help pandas. 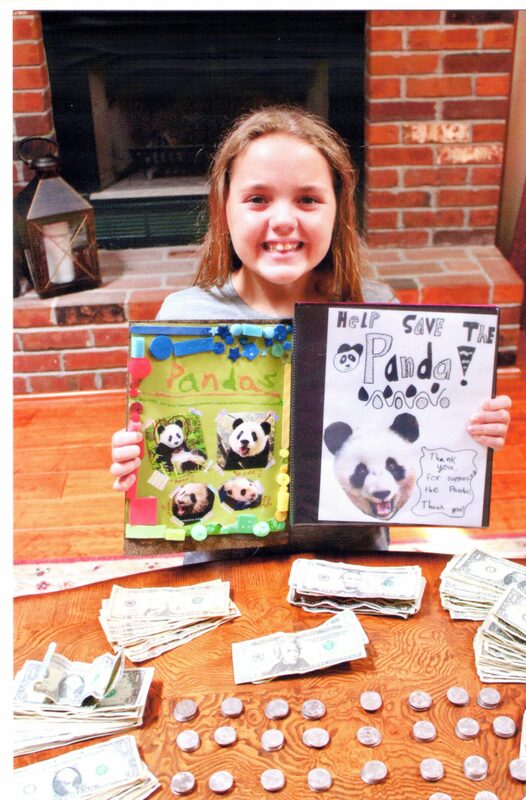 She researched possible charities and found Pandas International to be a great organization for her donations. Olivia’s lemonade stand was fabulous! It was a blistering hot day when Olivia set up her stand. 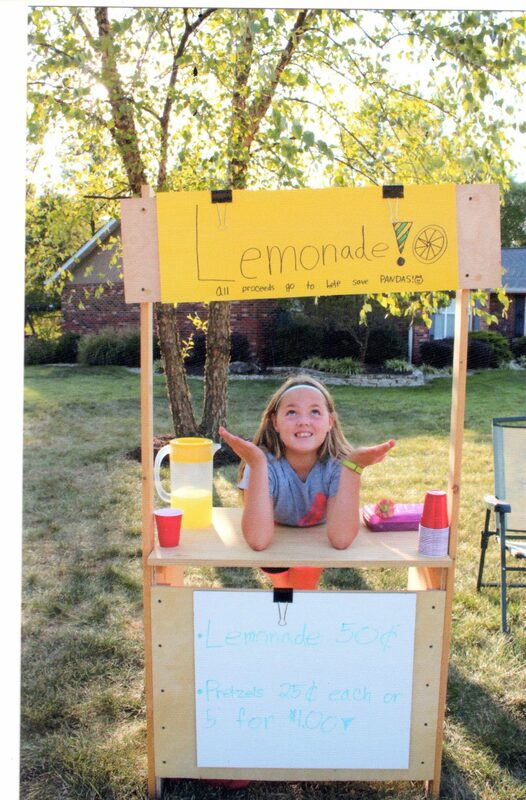 She sold lemonade and pretzel rods to many people in the neighborhood. She insisted on staying out almost all day until early evening so she could sell as much as possible. Some people came to the stand twice and were so impressed with her dedication (and her lemonade!). Olivia raised $155.46 that day. 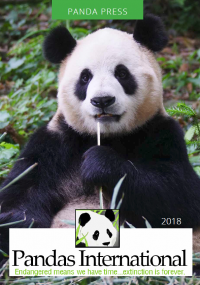 She was thrilled with her success and inspired to do something else to raise money for pandas. Olivia created a binder with ideas for a fundraiser at school. She organized her ideas and thought out her fundraising possibilities. She wanted to meet with her Principal, Mr. Birdsong, so that she could pitch her ideas. Olivia was very persistent in asking me to set up this meeting! When Olivia met with Mr. Birdsong she presented several options for fundraisers that could be held at school. 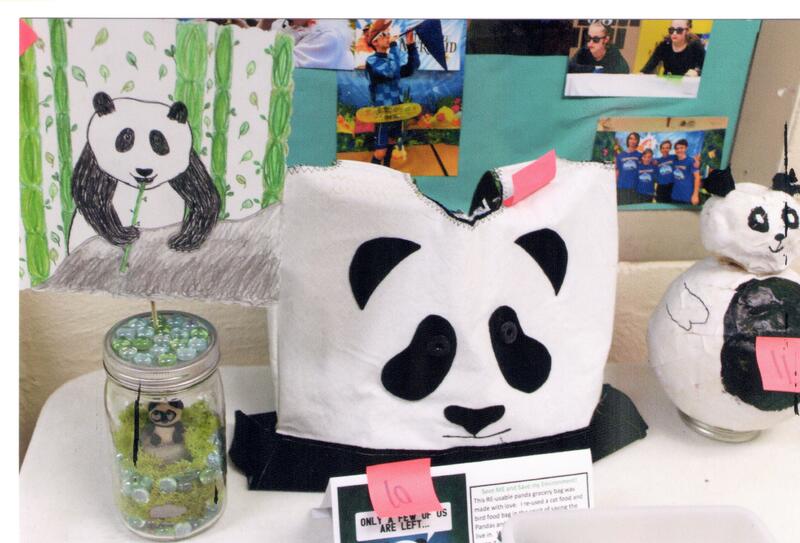 Mr. Birdsong and Olivia decided on a “Panda Protector” contest where students could paint, draw, make a model of, or create some kind of panda. The entries would be “voted” on by the entire school in the form of money. Students could vote as many times as they wanted and could use change or dollars. The winning entry would receive a Target gift card and the student who won would also earn their class a donut party. Olivia got up in front of the entire school at an assembly to launch the contest. She spoke about Pandas and told the students about the “Panda Protector” contest. She made posters and signs and hung them up around school so everyone would remember and get excited about the contest. The students at St. Teresa really stepped up to help! There were a lot of entries (15-20) and many votes were cast. Olivia enlisted the help of her friend, Britt, to help count the money. At the end of the contest there was $232.52 raised! Olivia was thrilled and was so happy she could help the pandas. After combining the lemonade stand total and the school contest total, Olivia is donating $387.98 to Pandas International! She is so excited to be able to do this and we, her parents, are so proud of her for her perseverance and dedication to raising money for a cause she cares so much about.